We’re touring a home filled with wood tones and built with exquisite architectural angles. Inspired by Japanese architecture, the look of the home is simple and in tune with nature. We’ll see warm touches that make this home a comfortable place to relax after a day of exploring the outdoors. The architects at Curationer created a balanced home full of wood.Let’s start our tour now and learn what makes wood such a perfect foundation for a beautiful home. The home has a magnificent roof. 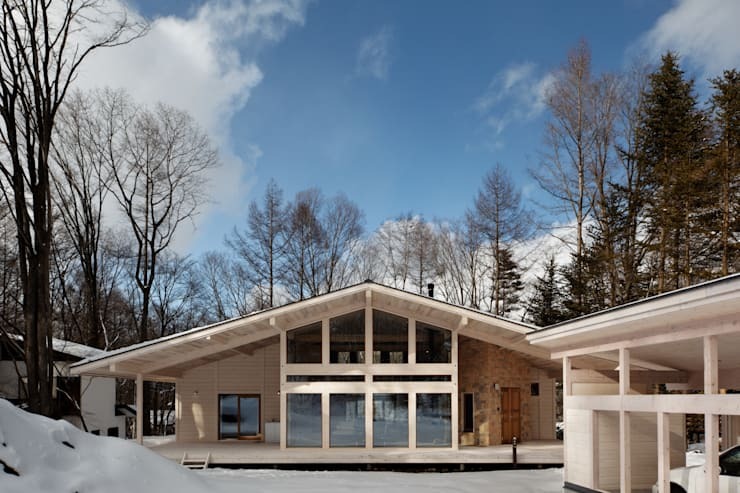 A gentle slope and wide eaves that overhang evoke a Japanese style chalet. The result is a soothing design that creates covered outdoor terraces as well as an aesthetic focal point. At dusk, the home glows from within. 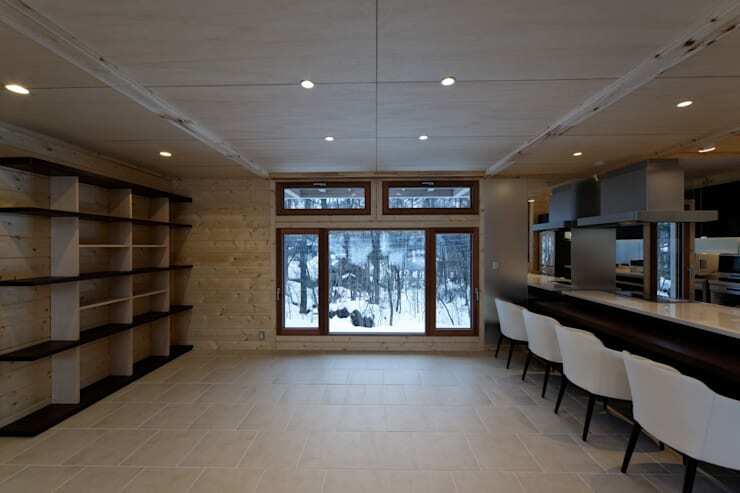 Snow surrounds the home and makes the wood interiors feel all the more enticing. In Japanese design, there’s a reverence and affinity for nature. The home seems like it’s being hugged by the woods that surround the home. 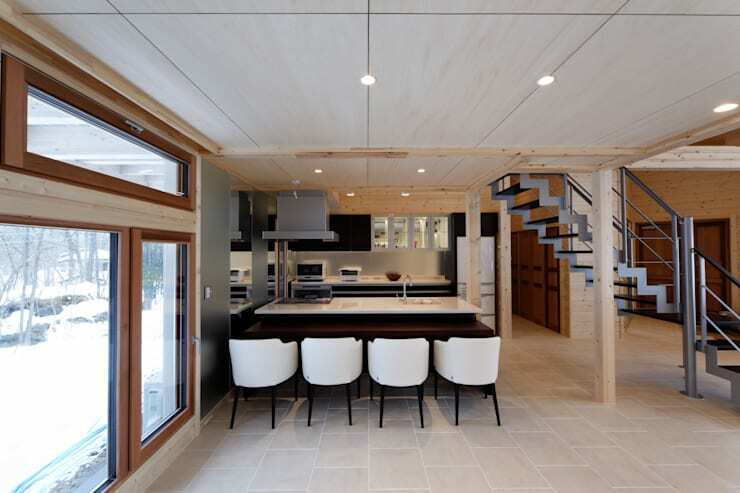 We’ll see that the home uses a myriad of shades of wood in its design. We can almost smell the natural wood that lines this entrance. The long, pale slats of wood have freckles of dark knots and give the home unique beauty. Window frames and doors are done in a darker and richer tone of wood that brings warmth to the design. It reminds us of a lodge or perhaps a cabin. We love the simplicity of this entryway, but it could be punched up! Entryways are more functional when they have a bench to put on your shoes and a mat to keep the floors clean. If you felt a little claustrophobic in the entryway, we’re sure that this open plan living room space will comfort you with its openness. The architecture of the home is stunning because of the exquisite angles. The gentle slope of the roof, 90-degree angles of the supporting beams, and countless rectangular windows create an impactful design. The home’s main floor is expansive and airy. The ceiling is high and gives you the feeling of being in a luxurious space. All of the furnishings is simple and low to the ground. One highlight of this living room is the black wood-burning stove. It’s the ultimate way to stay warm in the winter and give your home an old-fashioned ambience. The living room is glassed in like a conservatory or sunroom. 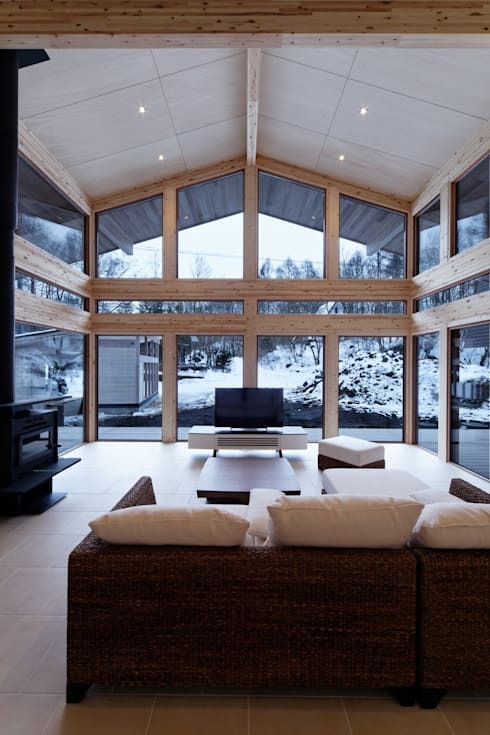 The plethora of windows creates a panoramic view of the wintry landscape outside. The simple beige floor tiles reflect the light coming in from the windows and make the space feel bright. It feels like you’re almost outside when you’re sitting in this living room. Tucked underneath the loft, this kitchen feels extra cozy. A breakfast bar lined with seats on one side creates a kitchen where you can be social and eat casual meals. 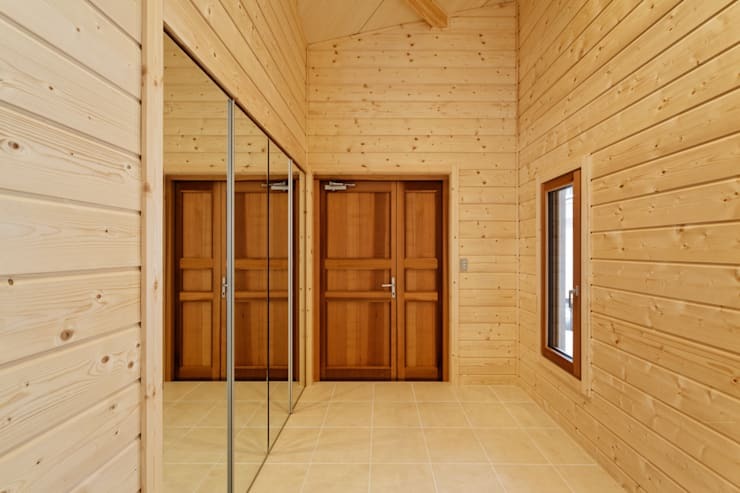 Panels on the dropped ceiling bring even more wood tones to this Japanese chalet style home. Check out the sculptural black staircase going up to the loft! The barely-there stairs keep the room feeling open. Looking at the kitchen from this angle, we can see its deep dimensions. Next to the large kitchen is an open space. You could put in a reading nook here, or, more practically, a dining table and chairs. There’s a built-in shelving system that could be a makeshift library if you use it as bookshelves. It could be an open concept pantry or a place to put up family photos and your favourite trinkets. Having a built-in spot like this in your home means that you won’t have to buy extra pieces of furniture. 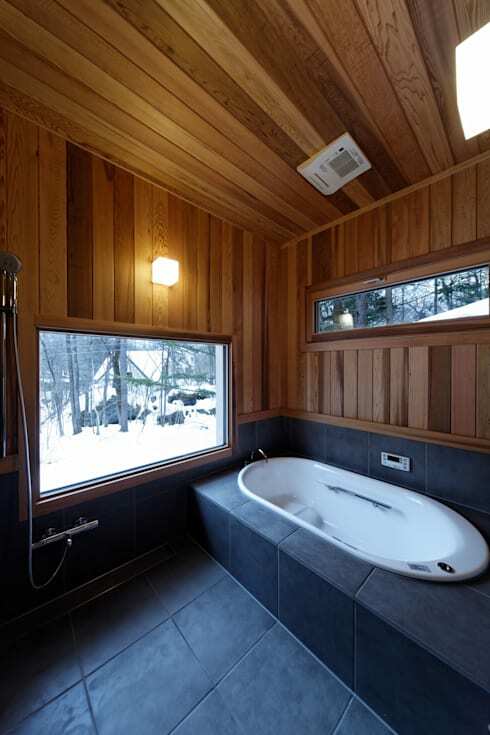 One of our favourite features of the house is this sauna inspired spa bathroom The cherry tones from the wood panels used in the design make you feel warm. Dark tiles around the soaker tub and on the floor fill the room with a woodsy and masculine energy. There’s a primitive and cave like feel to this bathroom that’s very inviting. The clouds have parted and the sun is shining on this lovely home. Soon the snow will melt and spring will come. Inside the living room, there will be views of lush greenery to complement the light wood tones inside the home. 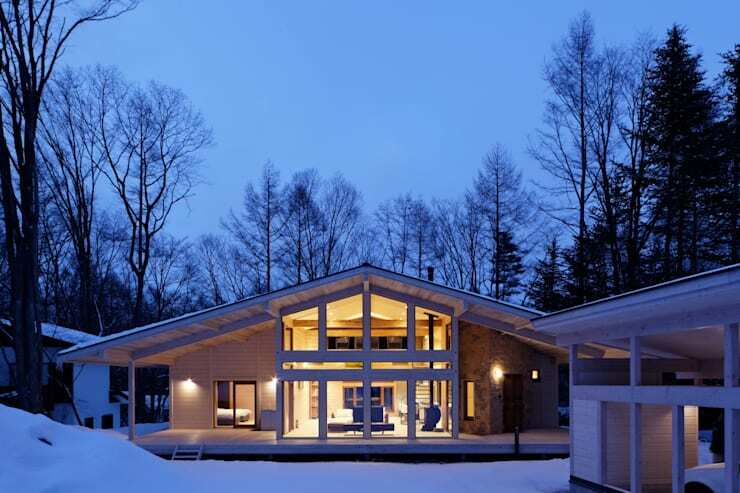 Living close to nature and in tune with the seasons, this Japanese home is inspiring. If you love Japanese architecture then don’t miss our feature on a home where zen meets ultra modern. What do you think of the simple approach to design?